View More In Electric Burr Grinders. 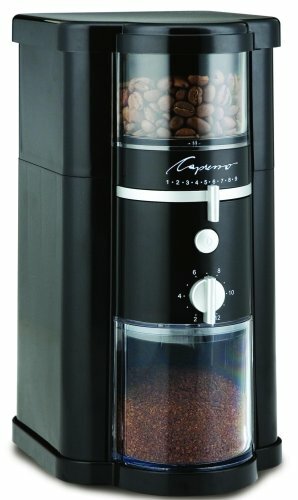 The Black Disk Burr Grinder with handsome Black ASB housing is the latest creation in Capresso's line of burr grinders. The grinder features an innovative vertical design which ensures that no ground coffee remains inside the grinder after use and minimizes static. It features an insulated grinder lid that makes it the lowest noise grinder in its class. Internal power cord storage lets you retrieve the required amount of power cord. If you have any questions about this product by Capresso, contact us by completing and submitting the form below. If you are looking for a specif part number, please include it with your message.